For the smoothest purées, the fluffiest mashed potato, and the most delicious apple sauce, you don’t have to go to a restaurant. Just go to your kitchen cupboard! Well, provided you’ve got an Avanti Rotary Food Mill tucked away in there, of course. Then, you’ll be able to make all these things – and more – just like in the top restaurants. How does it work? Well, for instance, if you want to make mashed potatoes (without the lumpy bits), just pop your cooked potatoes into the Food Mill, and place it on top of an empty bowl. Turn the handle slowly – and before you know it, the bowl or saucepan waiting below will be filled with delicious mashed potatoes – guaranteed lump-free! Experiment a little – the Rotary Food Mill will help you make your own homemade tomato sauce, your own apple sauce for that perfect Sunday roast – and lots more. It’s seriously easy to use, and it comes with two extra discs. It even manages to sift out seeds, skin, fibres and more, so you won’t find them in your food. Includes three discs, each with different diameter holes. Partially disassembles for easy storage. Fits on top of a saucepan or bowl. 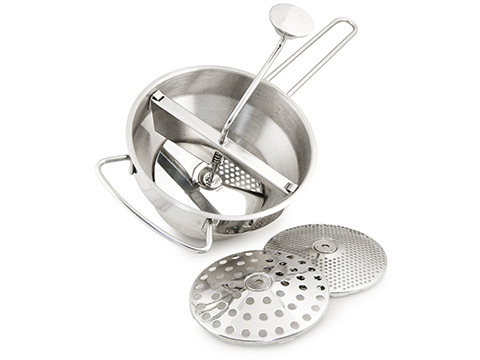 Easy to use – just put your ingredients inside and turn the handle.